On the 12th of March at the British Embassy, the British Alumni Club together with RBCC held an event entitled: Russia What Happens next. 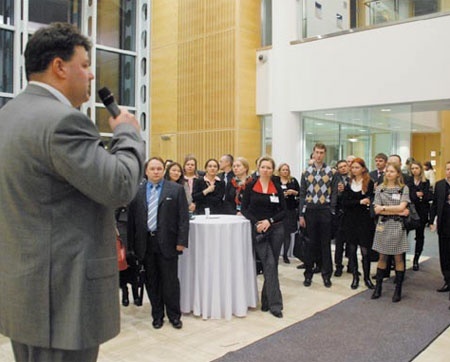 This event afforded British graduates; mostly Russians to network with RBCC members in a cordial atmosphere before and after listening to a very informative presentation by Standard & Poor’s rating agency. Alexei Novikov, the Managing Director of Standard and Poor’s Russia and CIS representation justified the rating agency’s decision to downgrade Russia from last year’s high of AAA. He gave many reasons, such as stating that: “Russia’s economy is 93% commodities, with the world economy suffering a slowdown; this is having undeniable effects on Russia’s economy.” He also said that Russia’s real exchange rate rose too quickly, leading to a kind of Russian version of the ‘Dutch Disease,’ with activities in two of Russia’s main economic drivers: natural resources and construction, falling quickly, whilst a fairly high rate (30%) of Russia’s credit is founded externally.